About the bus This vehicle was quite an interesting choice for a model from Roden, and I could not go past it when I visited my local hobby store. 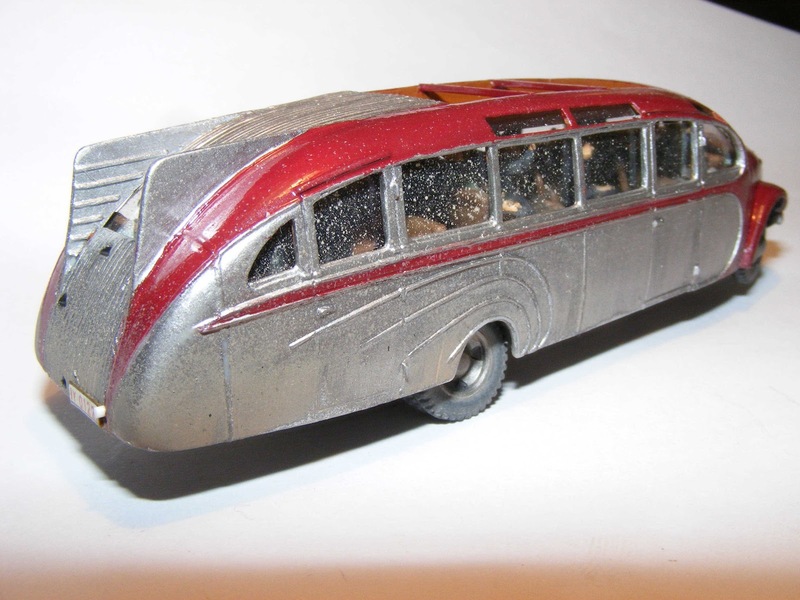 For a 1930s vehicle this bus had very futuristic styling. The bus chassis is the same as the 3.6 Opel chassis used on conventional buses. The instructions advise the name was meant to conjure up the idea of a 'zeppelin for the autobahns'. 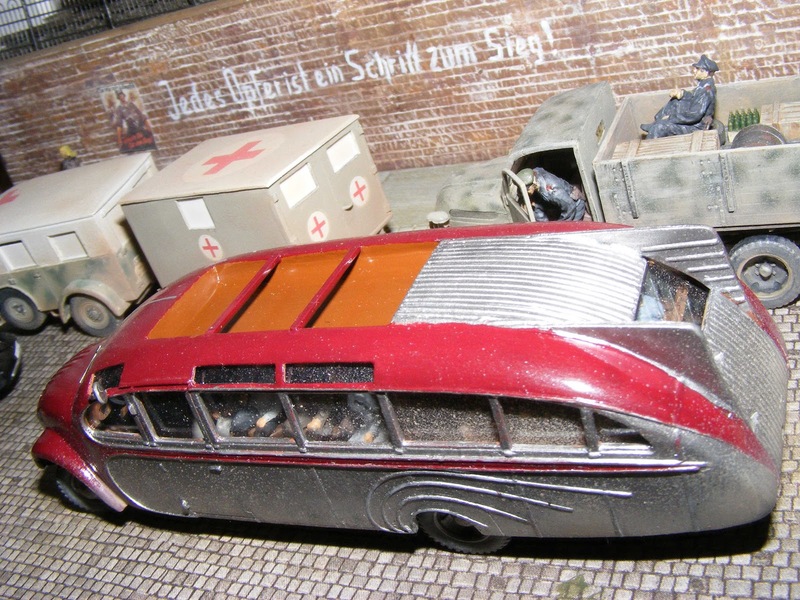 Not many were made by the Ludewig Brothers workshops in Essen and the small construction run were used for inter city transport as well as for propaganda purposes at the 1936 Olympics and as crew transport for Luftwaffe units. 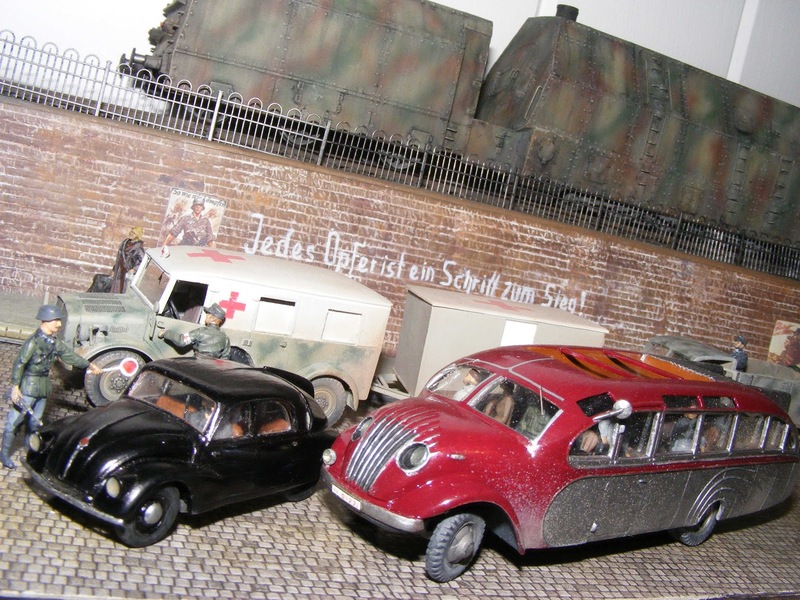 There is one black and white period photo of one of these buses being used as a troop transport, not an unusual event in a wartime economy where most motorised transport was put to military use. The kit. 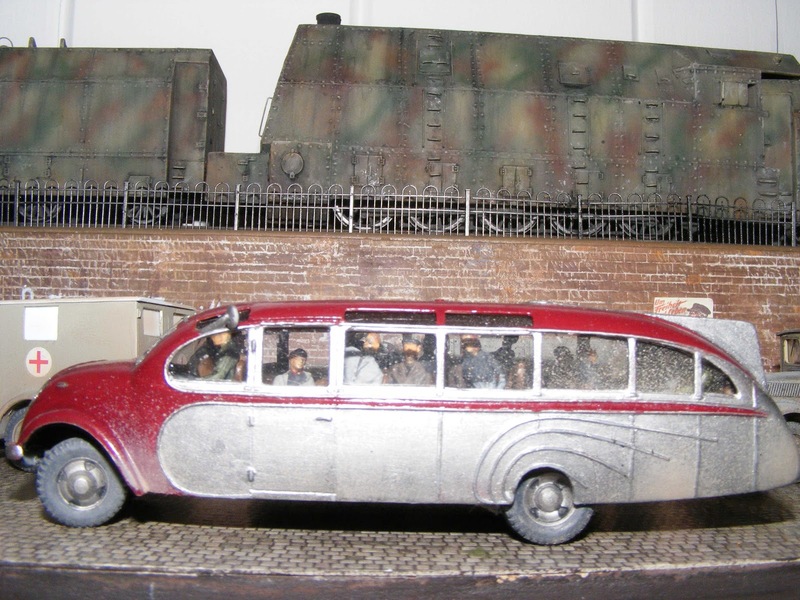 The box contains 7 sprues, the largest being common to Roden's other bus kits, however the other 6 sprues are specific to the Strassenzep bus. A set of instructions, decals, and a clear sheet of acetate for the window glass rounds out the contents. The build. I assessed that the body was the most critical part of the build to get right, so assembled those pieces first. I noted light flash on all the body components which needed a careful scrape with a fresh exacto blade, and a light sanding in some places. All 5 major body panels were only a so-so fit. Some careful trimming and then some filler and sanding were required to get smooth joins and seams. Below pic shows how the 'nose' of the bus assembles. Side view of body. 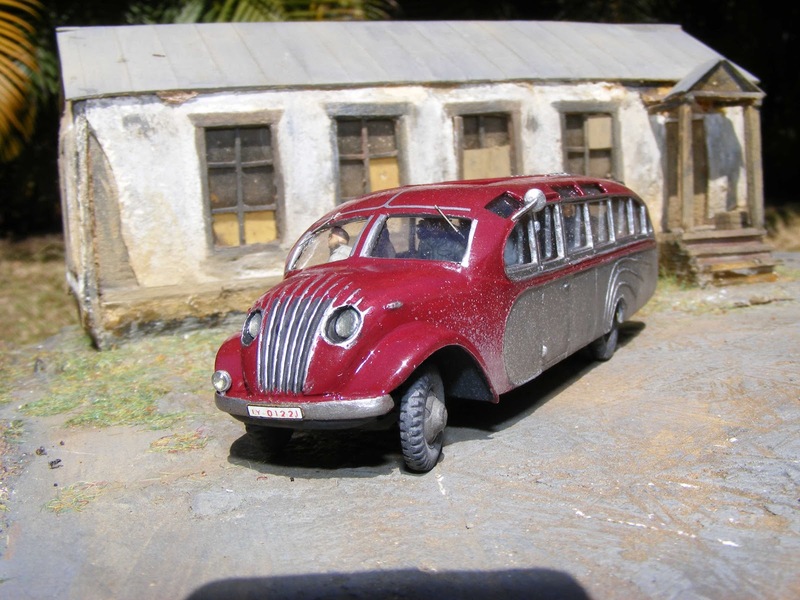 The chassis is the same as the conventional Opel bus, though new wheels are provided. Below is a test fit of the body and chassis. The fit is quite good, though the chassis frame is a little short, so I have added some evergreen to the front. 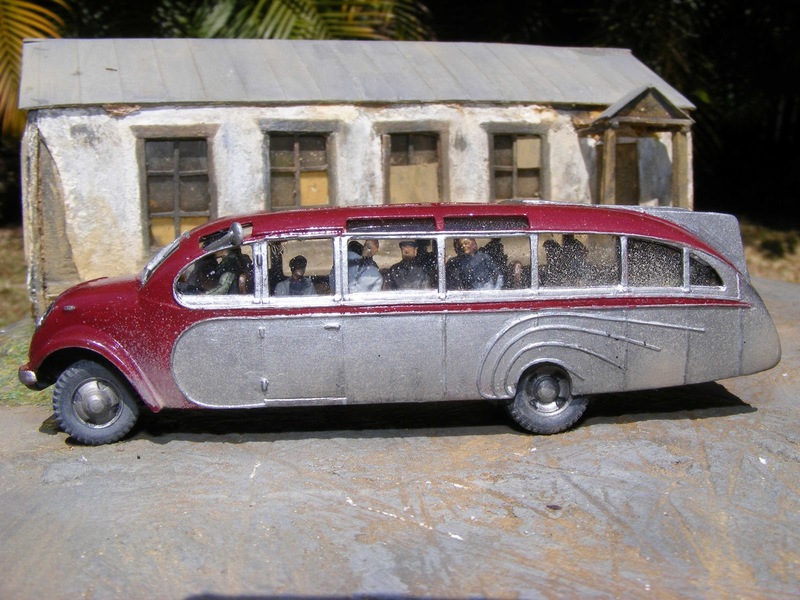 with the additional room, the kit instructions advise to leave out the fan and radiator, as appears not enough room, but they could probably be squeezed in if anyone is keen enough to try. I decided as they are not seen, these parts can go to the spares box. The dashboard and firewall also fit quite well. Still need to mount the mudguards and front bumper. The front wheels are movable as per Rodens blitz trucks, the front axle is the same. Update 09 September 2012. 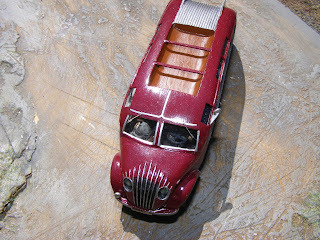 I have now fitted the dashboard, front fenders and bumper bar. A problem with fitting the mudguards, is there are no pins of lugs of any description to aid with locating them precisely, as to angle and width. I studied the front, side, and top down views on the box to decide exactly where these should go. Some filler also needed as a slight gap exists along the joins. I really like the appearance of this vehicle - the front looks a bit like a VW Kafer to me. Update 26 September 2012. No updates for the last couple of weeks as I wasn't feeling very well. I have now fitted all the internal seats. 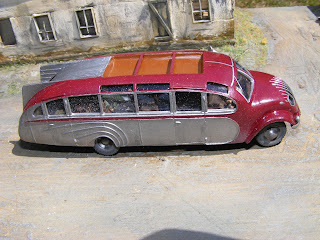 I have checked some reference pictures of the real bus (from the link kindly provided by FBMinis under Comments section for this post). It can be seen there that the headlights were recessed, and the recess is lined, not open space under the hood. 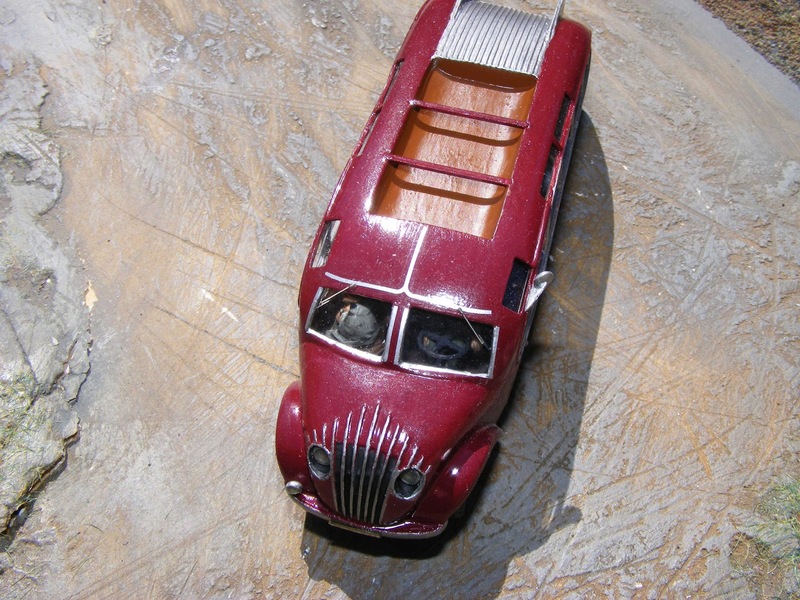 This kit has open holes and the headlights are to be mounted a few millimeters behind the openings. This should look OK, but I decided that lining the space would look better, pictures below. First picture (below) shows how I aligned the mudguards with the body and the front bumper (as mentioned in last update there are no pins, marks or lines to assist with precisely loacting these at the correct width and angle. 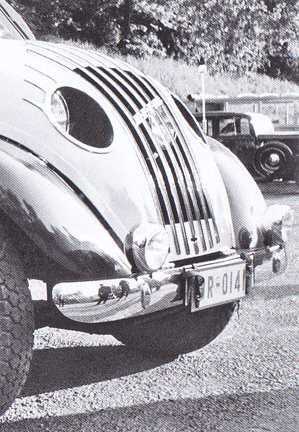 Below picture shows that the headlight recess on the real vehicle is lined and painted a very dark colour (or is maybe just deep in shade). This bus is a slightly different variant with a few cosmetic changes, but this part of the bus looks the same on all the Strassenzeps. Below picture shows what I used for the lining, being a paint brush bristle sleeve, cut to the right angle and affixed with a little white wood working glue. Below picture shows the recess linings painted dark grey to check for fit. Next job will be to mount the headlights. Update 30 September 2012. Time to get some paint on the body shell. This has to be done before affixing to the chassis as the clear window acetate has to be fixed inside the window frames before affixing the body to the chassis. The painting guide suggests 'Silver' for the sides, and 'Chrome Silver' for the line details. I have various shades of silver and all look exactly the same when test painted on a piece of white plastic card. In the end I did a base coat with Revell 91 'Metallic Steel'. This looked OK, but not as fine as I wished, so then gave another coat of Citadel acrylic 'Chainmail'. As all the shades of silver are very similar (and I know from eye tests that I have full colour perception), I painted the details with the same silver paint. The interior. The seating arrangement is quite crazy looking, but plans and photos of the inside of these buses show it is about right. As the photos are black and white I used shades of brown that I hope are typical. 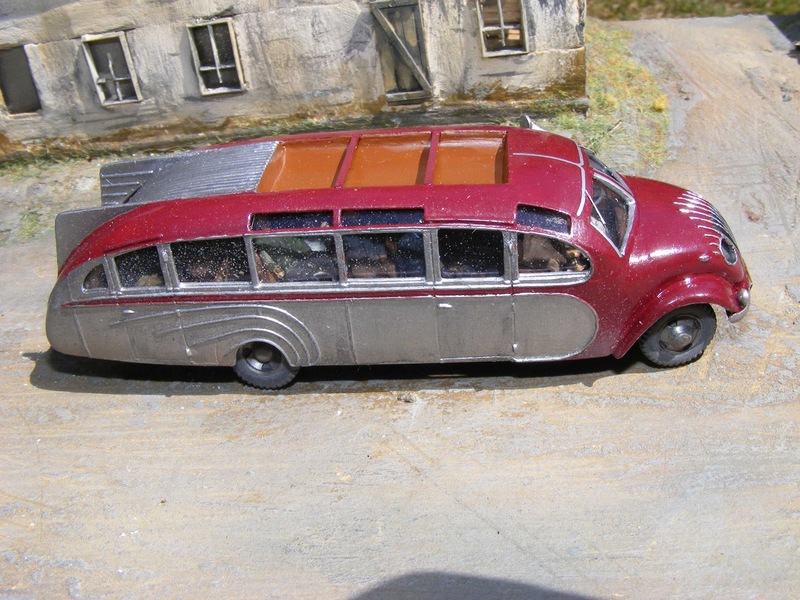 I still need to tidy the paint job, & affix the clear window acetate, & maybe put a driver and passengers on some seats before joining the body and chassis. I also need to put in the headlights. Then I need to affix window wipers, rear view mirror, and decals, so this one is not over yet. Update Tuesday 09 October. This bus has many windows, giving some views of the interior. I decided to fill it with people in civilian dress rather than in military clothing. 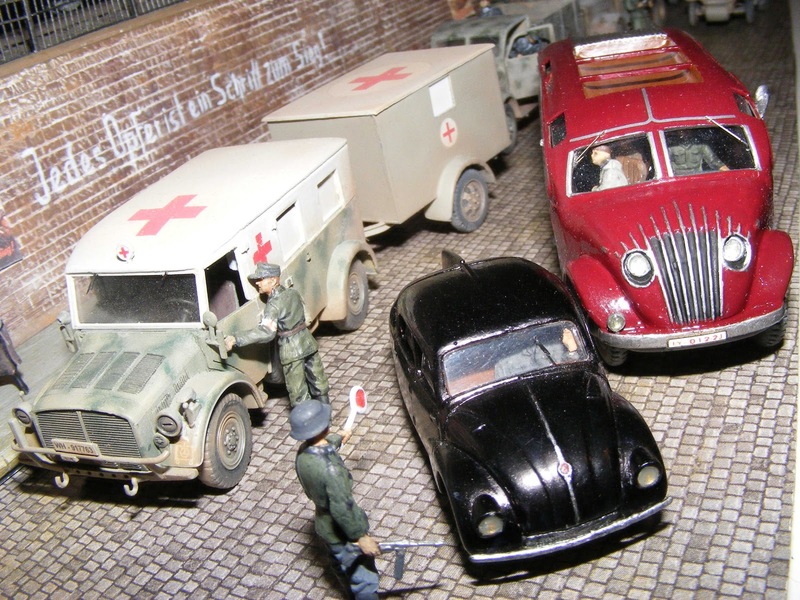 The figures used were Preiser 72 scale Seated Workmen, and Atlas HO scale Pedestrian figures, many in this set are seated and includes females. The window glazing was also added which is clear acetate sheet. 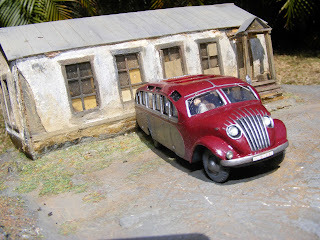 The rear and side windows being flat were easy to affix. 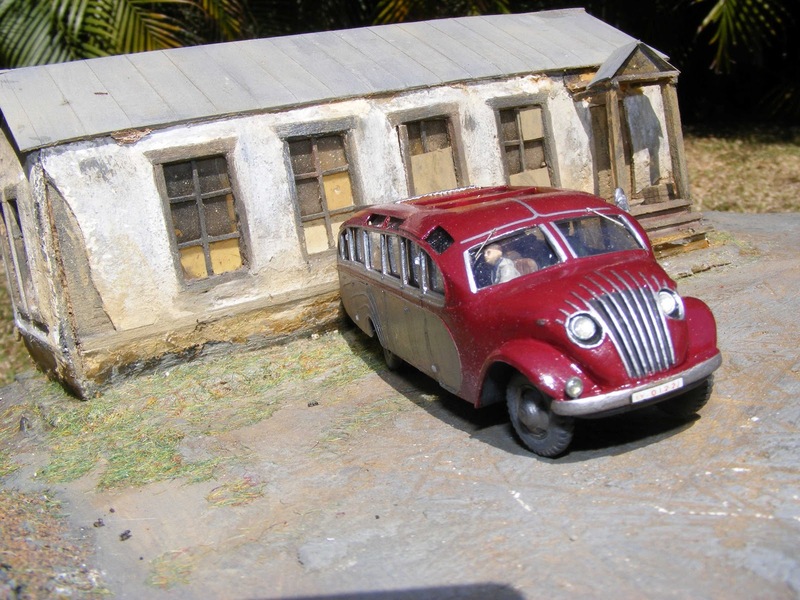 The roof windows and front windows were a little harder due to the window aperture being curved (on the roof windows) and slightly curved for the front windows. 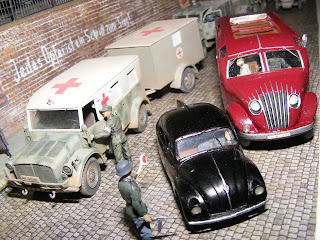 The rear vision mirror was also attached, as were the decals around the front windows. The decals to frame the bottom of the front windows are straight, but really need to be curved to properly fit the frame. I used Citadel Chainmail acrylic paint to touch up where the decals didn't quite fit properly as it matches the silver of the decals and is indistinguishable from the decal. The window wipers were the work of Ilian Filpov who makes excellently detailed etch pieces. I still need to fit numberplates, the driving light, and headlights. Update 14 October 2012. The bus is now completed. 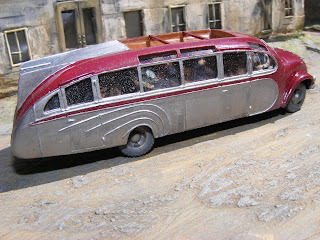 I gave it a very light spray on some lower surfaces of very diluted light brown enamel paint, to make the bus look like it had dirty water splashed on it. 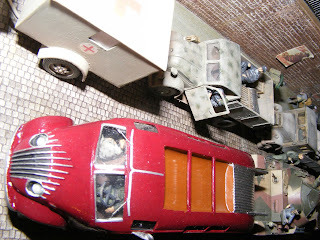 The intention was not to make the bus look like it was a 4 x 4 that had been on a military campaign, which is why its mostly clean, except for the splashes from puddles. The bus will sit on an already completed diorama, pictures of the bus on this diorama are below. 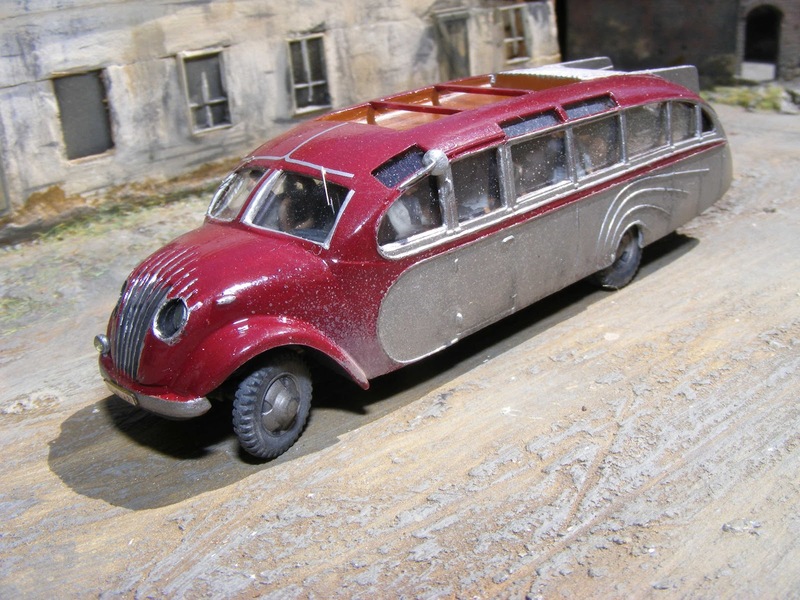 cool, interested to see how this turns out, I want a military version of Rodens Opel bus, but want to knock down my stash some before buying any more kits. Nice build, Neil, and a very interesting subject. After seeing yours, I'll definitely buy one of these. That is a splendid and splashing wonderful and entertaining sight to see with all those people riding inside the red batmobile bus. Wow, no comments since 2012, and here it is 2016 ... and I am building this same bus model. Fantastic job on your own build, lovely work (love the addition of the people), and thanks so much for helping me solve several little building problems at the same time.